The esophagus is a muscular tube like organ that is about 10 inches long, that continues from the pharynx to the stomach. There's a process called peristalsis, and in this process there's a muscular contraction which pushes food and liquid from the mouth to the stomach. When you swallow, there's a fold of tissue that closes so food enters the esophagus and not the windpipe. but it's actually more of a stricture. The Lamina Propria: This has a thin vascular layer of areolar connective tissue beneath the epithelium and is part of the mucous membrane. 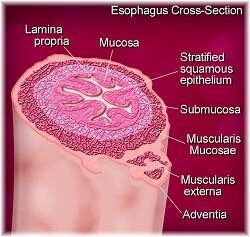 The Mucosa: Another name for it is "mucous membrane". These are linings of mostly endodermal origin, covered in epithelium, and are involved in absorption and secretion. The Stratified Squamous Epithelium: This serves as a protective effect because of huge amounts of food, saliva and mucous into the stomach. The Submucosa: Contains the mucous secreting glands (esophageal glands), and connective structures termed papillae. The Muscularis Mucosae: This is a thin layer of smooth muscle found in most parts of the digestive system. The Muscularis externa (or "muscularis propria"): With this layer composition varies in different parts, in order to correspond with the control over swallowing in the upper portions and the autonomic control in the lower portions: upper third, or superior part: striated muscle, middle third: a combination of smooth muscle and striated muscle and the inferior third: predominantly smooth muscle. Adventitia: This is the outermost connective tissue that covers the organ. There are two sphincters that are a part of this organ, known as the upper and lower esophageal sphincters. The upper esophageal sphincter prevents food from going into the windpipe. The lower esophageal sphincter keeps food in the stomach. There are quite a few disorders of this organ that affects many people such as acid reflux, heartburn, and Barrett's esophagus. To return to the What Is Acid Reflux page click here.